Nervous about the turbulent U.S. election? So is Wall Street. The S&P 500 closed on Tuesday at a four-month low and in the red for the seventh day in a row. That's the longest losing streak in nearly five years. Even though there hasn't been one big eye-popping stock market swoon recently, there's definitely been a mood change -- and not a good one. CNNMoney's Fear & Greed Index is suddenly flashing "extreme fear," compared with "neutral" just a few weeks ago. And the market's key volatility gauge, the VIX (VIX), has crept up to the highest levels since the aftermath of the Brexit shock in June. Veteran market observers point the finger squarely at politics. Specifically, they blame new polls that suggest Donald Trump's chances of winning the White House have risen. "A Trump presidency strikes fear in a large percentage of investors," according to a report from Bespoke Investment Group. "As his odds have risen over the last few days, the market has sold off." Nicholas Colas, chief market strategist at brokerage firm Convergex, described a "major sentiment shift" due to the election. "Up until last week, most investors felt they had the market very well figured out. The layout was very calm, largely predictable," Colas said. Now, the markets are "on guard," Colas said, due to Trump's rising poll numbers and the FBI review of Clinton-linked emails. "Nobody wants to do anything until they see the results of the election," he said. Gold prices, which tend to climb when people are worried, are up 3% over the past week. On the other hand, the Mexican peso is down by the same amount. The peso tends to fall when Trump's odds of winning rise. Trump has talked very tough on trade with Mexico and is pushing to build a wall between the two countries, both of which are expected to hurt Mexico's relationship with its chief trading partner, the U.S.
An ETF that tracks Mexican stocks, called the iShares MSCI Mexico Capped ETF, (EWW) has slumped 4% this week. The increased nervousness on Wall Street is the latest evidence that the stock market is cheering for a Clinton victory. It's not that the markets love Clinton or know what would definitely happen under Trump. The problem is that investors abhor "uncertainty," and view Trump as more of a wildcard due to his lack of a track record and unpredictable style. 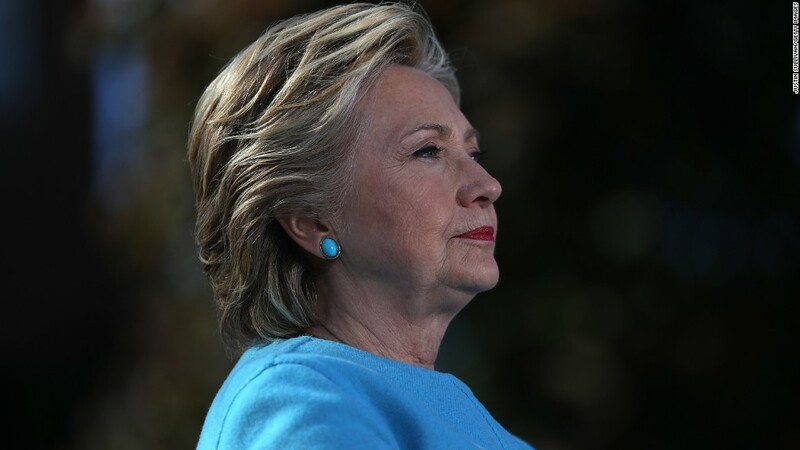 "When push comes to shove, the devil that we know (Clinton) is still preferable to the devil we can't begin to fathom," Michael Block, chief strategist at Rhino Trading, wrote in a note to clients. Yet polls have tightened considerably in recent days. The closely-watched RealClearPolitics.com national poll average gives Clinton a 1.7 percentage point lead on Tuesday, down from 7 points on October 17. Betting odds, which Wall Street also pays close attention to, suggest Trump is no longer being looked at as a long-shot to win. Betfair predicts Trump has a 28% chance of winning, up from below 15% a few weeks ago. Colas said many investors he's spoken to believe the odds are actually much closer because they've lost trust in both polling and oddsmakers in the wake of the Brexit shock. "To go from a sure thing to a coin toss in just a few days has really rattled investors," he said.